Hunting is dangerous -- for the prey as well as the predator. 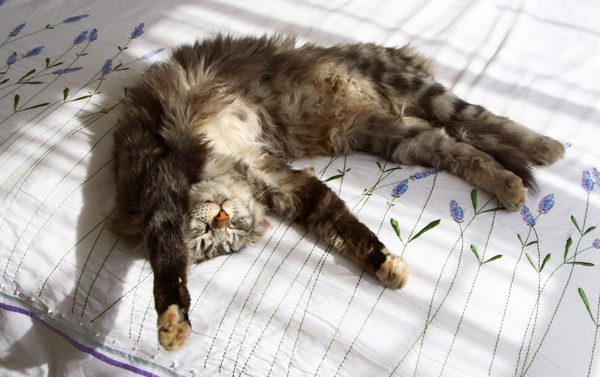 Here's how to satisfy your cat's natural instincts while she's safe inside. Living indoors has a lot of benefits — a warm place to sleep, regular meals, security, and laps to curl up on. Life isn’t as much of a struggle for indoor cats as it is for their feral cousins who hunt in order to survive. Although our stay-at-home kitties are safer not hunting for a living, they are still predators with the built-in instinct to hunt. It is common for parasites to hitch rides on rats, mice and other rodents. Additionally, prey animals often come equipped with contagious diseases. As far as the cat is concerned, this is a double-edged sword. Sick prey is weak and easier to catch than animals in the pink of health. The downside is that parasites and pathogens are frequently transmitted to the hungry cat. The most common parasites are fleas, tapeworms and roundworms. Sadly, many kitties become the unintended secondhand victims of poisons. They either eat rodents who have ingested the fatal substances or they eat other animals who have eaten the poisoned critters. Many people mistakenly believe their cats and dogs are safe on their property since they do not put deadly toxins out. Poisoned rodents are mobile. They wander from where they ingest the poison and then are frequently caught and consumed by other animals. Survival is a priority for all animals. Those who are about to become meals don’t take it lying down. When given half a chance they will fight back, biting the captor in their efforts to keep from becoming supper. Hunting is a dangerous business. 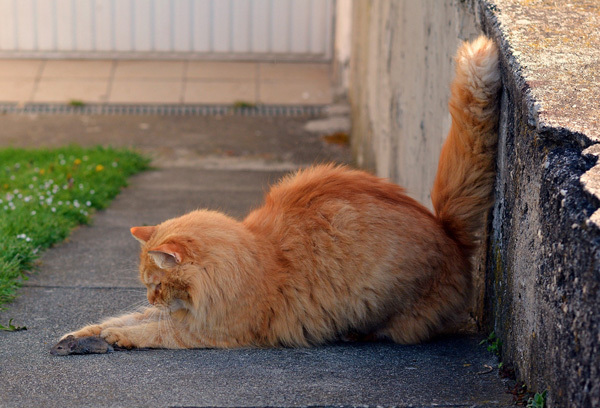 One bite from a desperate squirrel or rat can seriously injure a cat. So, how do you satisfy the predator within? Although our pampered felines do not have to catch dinner, they still have the desire to hunt. Ignoring these natural instincts can lead to unpopular behaviors, boredom and weight gain. The good news is that you don’t have to bring home live prey or fill your bathtub up with fish in order to keep your cat happy, fit and mentally stimulated. Play was invented for cats. It is mentally and physically stimulating, chasing away the doldrums while it addresses the hunting instinct. Design play sessions for the individual cat, but always keep in mind the cat’s age and other possible limitations. 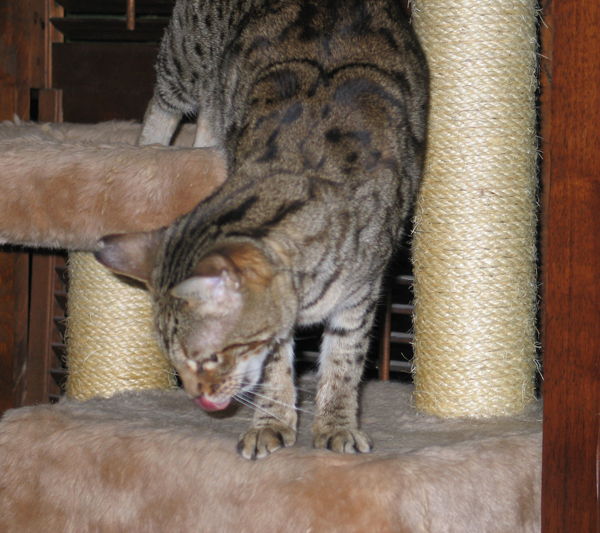 Youngsters and kittens by definition need more rambunctious, wild play sessions than older cats. 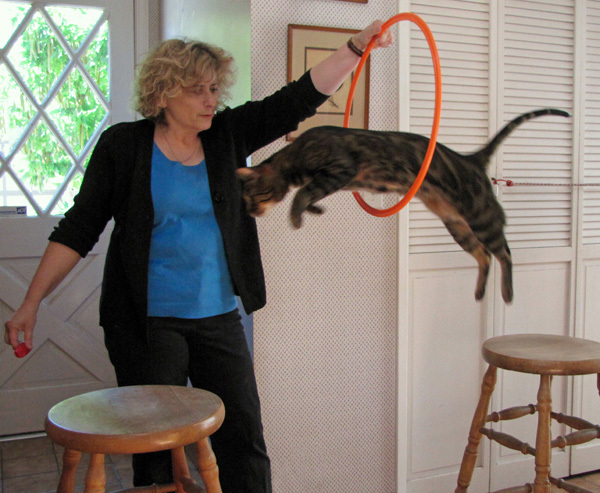 Pam Johnson-Bennett, certified cat behavior consultant and author, developed a method of play that most cats cannot resist. This technique successfully mimics hunting and is complete with stalking, pouncing and catching the prize. The best tool for the job is a pole toy with a dangling object on the end. Drag the toy away from your mighty hunter in a way that imitates prey. Keep the cat from feeling frustrated with the game by letting her periodically catch the prize. At the end of the play session, slow the toy down, mimicking prey that is tired. After your little hunter catches the toy one final time, immediately feed her a satisfying meal. She will eat, groom and then take a nap. Give your cat a job. Keep her active and stimulated by creating scenarios where she works for treats and some of her meals. Hide her favorite treats or cat food on furniture, shelves, in toys, and other creative places. After your little hunter is accustomed to the game, make it a little more challenging by placing treats in harder-to-reach areas. Good times for treasure hunts are before you leave for the day and in the evening. Exercise your cat’s inner predator through clicker training, a reward-based training method that has roots in science. It gives cats a focus while simultaneously teaching tricks and behaviors. It also teaches behaviors that are satisfying and fun for both trainer and trainee. An added benefit is that it builds confidence and helps kitties develop stronger bonds with their people. Although indoor cats who are fed regular meals do not need to kill for a living, they still have the natural instinct to hunt. Activities designed for the stay-at-home predator will address those instinctual needs. Cat parents also benefit — interactive sessions are fun, and they strengthen the bonds between you and your cat. Do you address your cat’s natural instincts with any of these methods? Let us know in the comments!